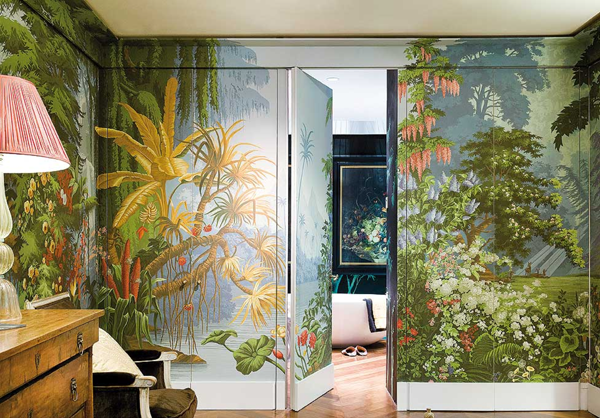 I really enjoyed taking a peek at Claude Cecil Gurney, founder of de Gournay, a design house best known for its luxurious hand-crafted wallpapers founded over 30 eyars ago and thought you would to. I just adore their beautiful handpainted, bespoke wallpapers that are pure luxury and have the power to transform a wall into a feast for the senses. 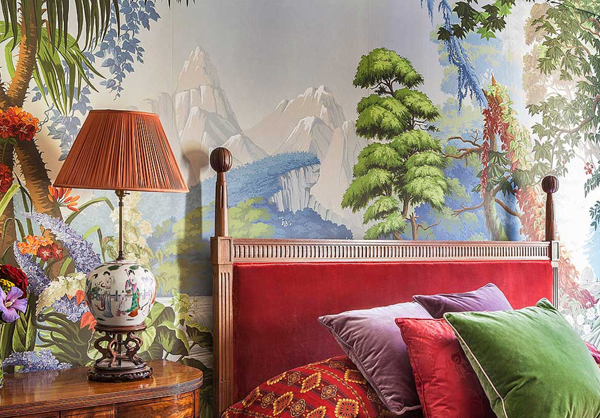 Mr. Gurney found a need in the market for high quality and bespoke wallpapers and founded the company upon the skills of Chinese artisans and painters. He was one of the first British entrepreneurs to work in China. 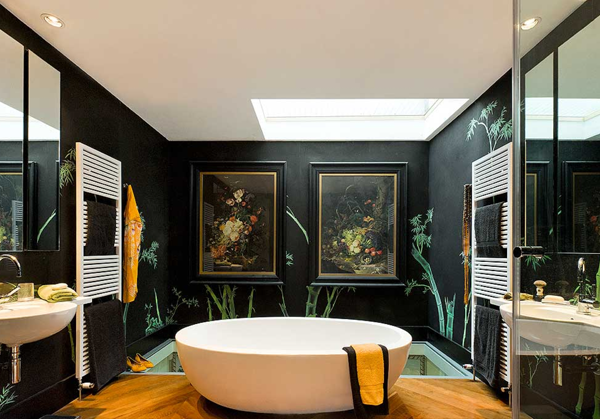 de Gournay is the original french version of his Mr. Gurney's name. I thought the article had mispelled his name! Silly me. I read the article because I was curious to see what wallpapers he had chosen from the many spectacular options to decorate his home. 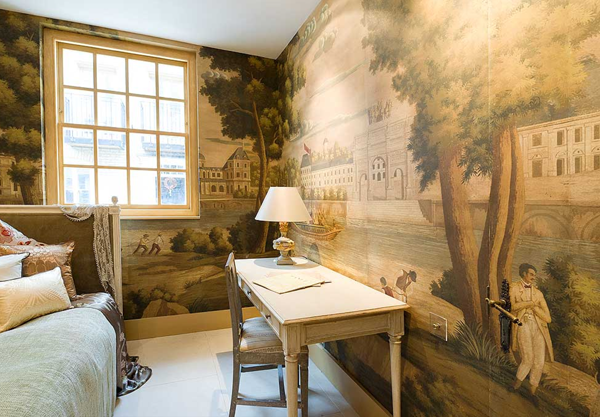 First, we begin in the Master bedroom with L'Eden wallpaper covering the bathroom and closet doors (Tres chic!!). In the drawing room he has the Willow pattern over Tarnished Silver wallpaper. It seems to be a magical and shimmery space. The white and bright dining room boasts a scene of Rives du Bosphore framed within a ribbon molding. In the bathroom he has the silk stamped Bamboo paper. Another shot of the Master's L'Eden. Another wallpapered bedroom. This pattern is Monuments of Paris. These papers are quite the investment. I wouldn't dare install one in my house unless I know it will be my forever home! What do you think? Do you find them as magical as I do? what a stunning space - I love how the art in each room is the focal point. Each piece is so interesting and draws you in! So beautiful and lush! I love all the colors in the Monuments of Paris room and the willow room seems so shimmery. Love!! WOW! This is absolutely incredible. Love the botanical walls! What gorgeous pieces of art! I love the willow room!!! Ah those are dreamy!!! I think the last in my bedroom is my favorite. What a successful risk. Each room was fantastic, but the willow wallpaper is my favorite. Absolutely dreamy!